Children over 12 years of age welcome.This means no infants either please. Ask Grandma to babysit! The exception is our new Puget Suite. It offers two bedrooms and is situated away from our other more traditional B&B guest rooms. Check in time is 4pm and 6:00pm. We will allow earlier check in by prior arrangement, and confirmation via phone the day before arrival, if we do not receive a telephone confirmation we will assume you will be checking in during normal check in hours. Check in before 2pm will incur an additional charge of $50. Please confirm if your arrival will be after 6pm. A late check out not prearranged will incur a charge of $100. Must be made by telephone (and will be confirmed). 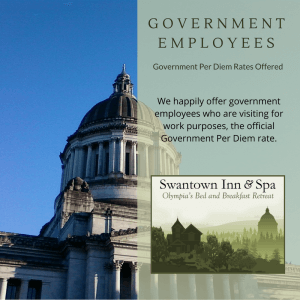 All cancellations, including shortening of a stay are subject to a $25.00 handling fee. Cancellations earlier than 7 days prior to reservation (14 days for holiday bookings, special events and long term) will incur no additional charge for cancellations or changes. Within the 7 (14) days, for cancellations or shortening of stay, the guest is responsible for a minimum charge equal to one night’s reservation and a maximum charge for each night the room remains vacant. A credit card must guarantee all reservations. Lost Key fee of $30. All cancellations, including shortening of a stay are subject to a $25 handling fee. The Inn is smoke free environment; this includes the burning of candles, incense, etc. Therefore please be aware that there is an additional cleaning fee of $500 if there is found to have been any smoking or burning of candles. Unfortunately we are unable to accept pets. For our guests who rely on the assistance of a service animal we do require a health care professional’s statement that you are an individual with a disability and will be assisted by a service animal. This is in compliance with ADA Act. Please let us know if you have any dietary restrictions prior to your arrival. It aids us in planning for your breakfasts, and that we are stocked appropriately. Check the availability and/or book our rooms. 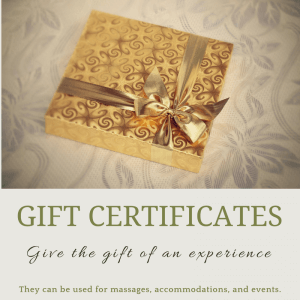 You may also be interested in Gift Certificate for a friend or loved one. Evergreen State College events (These include Orientation weekend, Graduation weekend, and any other special events). Our minimum stay for these times is normally four nights.